How have I never seen this video?Maybe it's because I didn't live in the U.K. in the Eighties. Or ever, for that matter. "There is no easy way to say this," reads a post on the band's official Facebook page. "Our mighty, noble friend Lemmy passed away today after a short battle with an extremely aggressive cancer. Motorhead guitarist Phil Campbell has confirmed that the band's hard-living frontman, bassist Lemmy Kilmister, 67, has been fitted with a pacemaker. Motörhead have been forced to postpone their planned European tour until February 2014. The reason? Lemmy Kilmister, their iconic bassist and frontman, needs time recover from his illness. 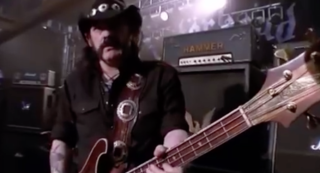 Dear Guitar Hero: Submit Your Questions for Lemmy Kilmister! Here's your chance to ask Motorhead's legendary frontman anything you want! Slash: "Lemmy Is in Good Shape and Finishing New Motörhead Record"
As we reported earlier this week, Motörhead were forced to cut short their set at Germany's Wacken festival last Friday after Lemmy Kilmister felt too weak to continue.